While China has achieved extraordinary economic success as it has moved toward open markets and international trade, its leadership maintains an authoritarian grip, repressing political movements, controlling all internet traffic, and opposing any democratic activity. Because of its huge population, more than half the people in the world who lack political freedom live in China. Its undemocratic example is attractive to other authoritarian regimes. But can China continue its growth without political reform? 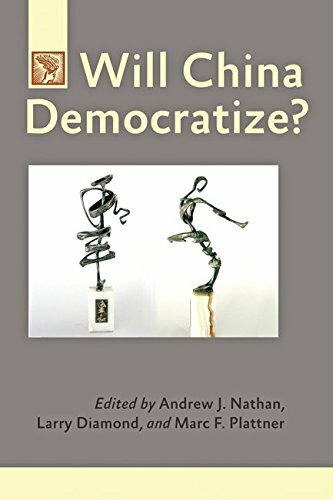 In Will China Democratize?, Andrew J. Nathan, Larry Diamond, and Marc F. Plattner present valuable analysis for anyone interested in this significant yet perplexing question. Since the Journal of Democracy‘s very first issue in January 1990, which featured articles reflecting on the then-recent Tiananmen Square massacre, the Journal has regularly published articles about China and its politics. By bringing together the wide spectrum of views that have appeared in the Journal‘s pages—from contributors including Fang Lizhi, Perry Link, Michel Oksenberg, Minxin Pei, Henry S. Rowen, and Nobel laureate Liu Xiaobo—Will China Democratize? provides a clear view of the complex forces driving change in China’s regime and society. Whether China will democratize—and if so, when and how—has not become any easier to answer today, but it is more crucial for the future of international politics than ever before. Andrew J. Nathan is a professor of political science at Columbia University, specializing in Chinese politics, foreign policy, and human rights. Larry Diamond is senior fellow at the Hoover Institution and the Freeman Spogli Institute for International Studies at Stanford University, where he directs the Center on Democracy, Development, and the Rule of Law. Marc F. Plattner is vice president for research and studies at the National Endowment for Democracy. Plattner and Diamond are coeditors of the Journal of Democracy.